Russia welcomed the world to the World Cup on Thursday as cheerful fans streamed into Moscow and 10 other cities and President Vladimir Putin's government derided Western efforts to isolate him. While Western countries chose not to send senior representatives to the opening ceremony, there are no sporting boycotts like the one that marred the 1980 Moscow Olympics, or doping bans of the kind that excluded many Russians from the last two Olympic Games. "Attempts at a boycott were doomed from the start," Deputy Prime Minister Vitaly Mutko, a close Putin ally and long-time sports minister, told Izvestiya newspaper. "It shows how foreign politicians are sometimes cut off from real life." Putin, grappling with Western sanctions since seizing Crimea from Ukraine four years ago, will attend an opening ceremony at Moscow's Luzhniki Stadium ahead of the first match of the month-long festival, pitting the hosts against Saudi Arabia. The president, newly re-elected after 18 years in power, will listen to British singer Robbie Williams with what the Kremlin listed as an array of 15 foreign leaders -- though that included eight from ex-Soviet neighbors as well as two from Russian-backed breakaway regions of Georgia. Rwanda, Lebanon and Panama were also named along with a senior official from North Korea. 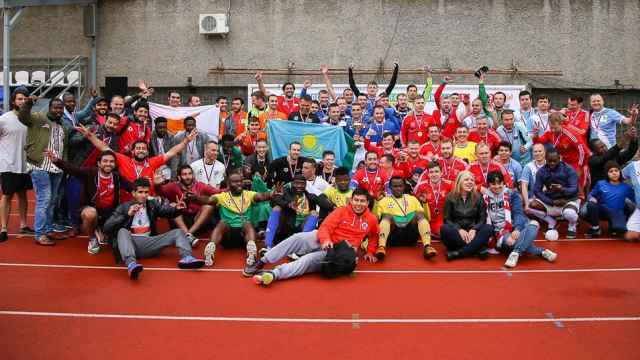 Putin hailed the world football governing body FIFA for keeping to a motto of "sport without politics". Speaking on Wednesday, as FIFA chose to host the 2026 tournament in the United States, Canada and Mexico, the Russian leader spoke of sport's potential to promote "humanity without borders". "Russia in Centre Field", headlined the state-run newspaper Rossiyskaya Gazeta. "The main victory is already won," it said, praising an organization effort that has seen a dozen stadiums built or modernised and a huge security operation put in place. The biggest event Russia has hosted since Soviet times, when the United States and others boycotted the 1980 Moscow Olympics over the invasion of Afghanistan, will put a spotlight on how Russia has, since the chaotic collapse of Communism, resurrected its economy and a tight social order under the former KGB agent. Talk of a sporting boycott after Britain accused the Kremlin of using a banned nerve agent to try and kill a former Russian spy in England failed to materialize. Western leaders are staying away, though the likes of French President Emmanuel Macron are likely to attend later matches if their teams progress, and protests and criticism -- of conflict with Ukraine or human rights abuses in Russia -- have been largely confined to foreign soil. Governments have warned their citizens to beware of violent Russian soccer hooligans and of a risk of racial and homophobic harassment in the streets. "All countries accuse each other of racism, homophobia. This has nothing to do with the World Cup," he told reporters. "As for the women of Russia, they can handle anything themselves." 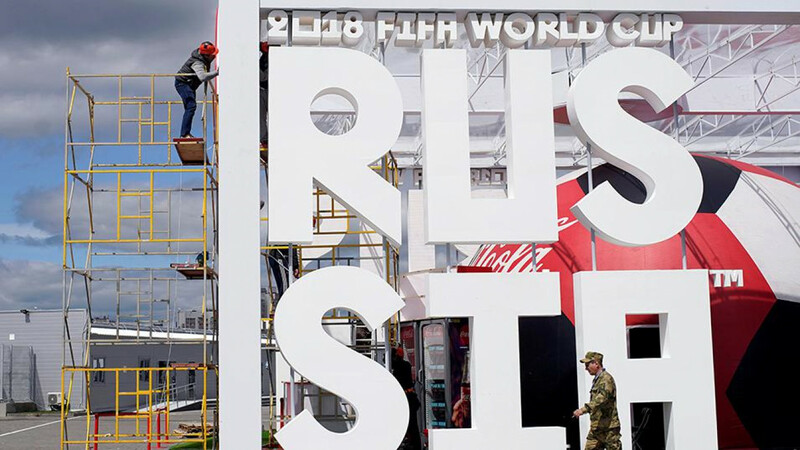 With some 200,000 visiting fans already in the country to follow the 32 teams in the tournament, the Kremlin is urging Russians to put on a welcome and get behind the home team -- a task not helped by poor form that makes it the event's weakest side by FIFA ranking. Russia coach Stanislav Cherchesov insisted that Thursday's opening festivities would wake the country up: "Half of Russia will only realise that the World Cup is happening when the whistle blows for kick-off." 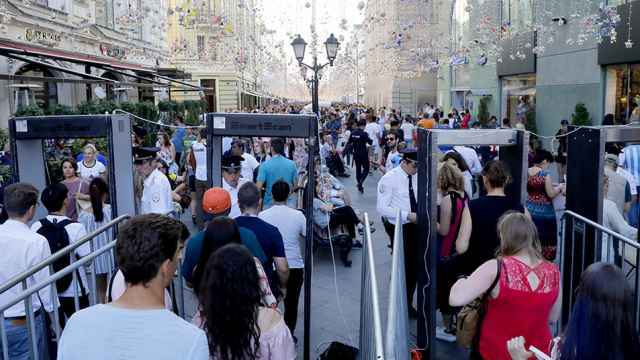 Moscow authorities have placed metal detectors at Nikolskaya as a security precaution until the cup wraps up on July 15. New data shows that tourists from the United States and China outspent other football fans during the first few days of the World Cup. Messi, as 60 kg of chocolate.